Sheriff’s investigators examine Connie Bauerdorf’s 1936 Oldsmobile, which was being used by Georgette Bauerdorf and disappeared after the killing, courtesy of the Los Angeles Public Library. One of the mysteries confronting investigators in the Georgette Bauerdorf case was what became of the car, a green 1936 Oldsmobile, California license 59-B-875 that belonged to her sister Connie and which Georgette was using while the family was out of town. (Daily News, Oct. 13, 1944). Bauerdorf’s car is frequently and erroneously described as a Pontiac, so here’s a comparison photo, courtesy of Wikipedia, of a similar model Oldsmobile, although this one has turn signals on the front bumpers. And here’s a 1936 Pontiac. which was for sale in 2012. 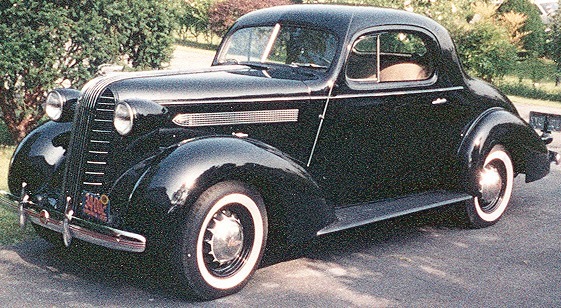 Here’s another 1936 Oldsmobile coupe without the turn signals on the fenders, courtesy of bballchico on flickr. The bumpers are slightly different. Notice that there appears to be a sticker in the window. I originally thought this was a gas rationing sticker, but I can’t discern the detail in either photo. In March 1944, an “A” gas ration coupon was reduced from 180 miles a month to 120 miles a month. In another story, The Times explained that an “A”” gas coupon was good for about two gallons of gas per week. Let’s compare Bauerdorf’s car with these modern photographs. First, there is no driver’s side mirror on the Bauerdorf car. Second, there’s a scrape along the left front fender, which is dented. The Bauerdorf car also has front-end damage to the grille and the left bumper guard is missing. News accounts state that the Bauerdorf car often broke down because of engine problems, so one could assume that the vehicle was not well-maintained during wartime shortages and that whatever damage it sustained in an accident wouldn’t have been repaired. The question is whether this damage was new and whether the killer had been in an accident en route from the apartment to where the car was abandoned. One news story refers to investigators speculating that the damage was recent, but there is nothing further about it. Is the specific address of where the car found known? The residential homes appear different than the neighborhood of her apt. As for what became of the car, your blog is not clear on the issue. Did it get stolen & the family reported it missing? Did the police seize it as evidence and refuse to return it / auctioning it? Are DMV records missing to explain a sale or stolen status? Yes. It’s in a future post. It was recovered by police. I suspect DMV records from the 1940s are long gone. If it’s a gas ration sticker, it’s an odd one. The “A” stickers were generally white on a black background, and by rule were to be placed in the lower right side of the windshield. Good lord, that car is bigger than my first apartment. During WWII, California, like most states, stopped issuing a new license plate every year after 1942. For 1943 and 1944, a small white tab with a red “V” was bolted to the upper right of the plate. This identified who had paid in 1943, but since the tab was carried over to the following year, there was a small paper sticker to be pasted on the inside of the windshield to indicate a 1944 current registration. Both of these are visible on the Oldsmobile. The California 1945 plates were a new stamping, black with white letters and strip at the top. A yellow tab was bolted to it for 1946, and tabs were used until 1956 when the black and yellow plates were issued for 1956. In the mid-thirties, General Motors shared bodies among many of its different brands. I think that coupe body was common to Chevrolet, Buick, Olds, Pontiac and La Salle, each with a different front-end treatment of course. Almost no prewar cars had drivers’-side outside mirrors (although some trucks did); bedamned if I know how people got along without them. The girls’ Oldsmobile was only eight years old at the time. That it received poor care at the hands of someone is shown by the dented/scraped fender, missing drivers’ side bumper guard and broken grille. Tires of course were unobtainable, but necessary mechancial parts to keep older cars running were freely available. GM did a similar thing in the 1950s, with minor design tinkering. As a child of a WWII fam, a WWII memories buff, an Olds driver and a mom of 2 teenage daughters, I, number 1, LOVE the post. I can assure you that car maintenance is not a high priority for some young ladies. LH, your reporting, as always. One of the (no longer a teen, really) daughters is a media writer and I just advised she follow this blog, and what you are doing with this story. Number 2, I love Charles Seims comments as well. Thank you LH for your consistently excellent reporting. My dad (d 1970) grew up in your area, in the late ’40s early ’50s, and your BD coverage, and now this, has been interesting background for a Georgia girl like myself.Middle class folks very rarely made an appearance in media in the 20th century, and I have found, that gruesome as some might find it to be, the best thing a researcher can do is find a crime that has happened in the vicinity of the 20th century U. S. area one is looking into. Thank you again, so much, for all your work.